Alejandro Urbina presents Music & Memory at William E. Cottle Elementary School’s December 2013 concert. 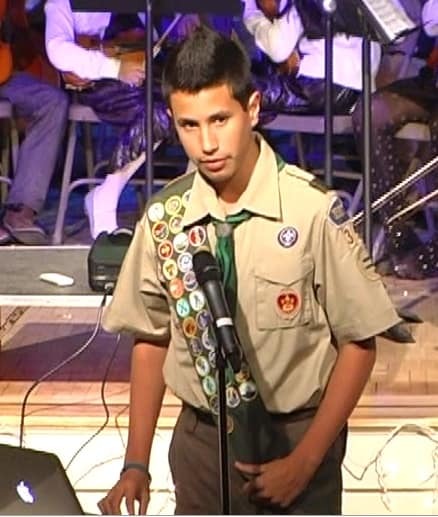 When Boy Scout Alejandro Urbina decided to raise money, gather CDs and collect used iPods for Music & Memory as a project to earn his Eagle Scout rank, he had no idea where the donations would come from. Like the 11 new iPods that his Scout Master—a detective with the Westchester County, N.Y., District Attorney’s office—contributed after the devices had served their purpose as evidence in a criminal trial. That’s just one example of the outpouring of donations and generosity that have greeted Alejandro’s efforts since he launched his project in December, presenting the case for Music & Memory at two Christmas concerts in his local school district, near his home in Bronxville, N.Y.
A sophomore at Tuckahoe High School in Eastchester, member of Troop 353 and guitarist with the high school band, Alejandro made a compelling plea before December concerts at both his high school and the local William E. Cottle Elementary School. His presentation included the moving video of Henry, a clip from the award-winning Alive Inside: The Story of Music & Memory documentary that was recently screened at the Sundance Film Festival, to rave audience reviews. The results of Alejandro’s campaign—which included meetings with school principals to help promote his effort through fliers, school announcements and newsletters; coverage in local media; postings and reminders on school Facebook pages; and networking with parents and other adults to connect with a Yonkers nursing home that Alejandro hopes to sponsor—have been nothing short of spectacular. As of March 1, when his donation drive ended, Alejandro had raised $1,300 and collected 38 iPods and 850 CDs of all kinds, including pop, Big Band, classic and alternative rock. His goal: Enable an area nursing home to become a MUSIC & MEMORY® Certified Care Facility, and bring the music to those struggling with Alzheimer’s and dementia. Alejandro learned of Music & Memory through his father, Julio, who is Vice President of the Manhattan-based Fan Fox & Leslie R. Samuels Foundation, where he serves as Director of the Healthy Aging Program. Committed to improving the lives of elderly in NYC, Julio introduced his son to Concetta Tomaino, a Music & Memory board member and Director of the Institute of Music and Neurologic Function. That visit inspired Alejandro to learn more about Music & Memory, and to conceptualize his Eagle Scout service project. Becoming an Eagle Scout is not easy. According to Alejandro, only 4 percent of Boy Scouts earn the rank, which requires demonstration of leadership and organizational skills by completing a service project that helps others. Now that he has collected all the donations for Music & Memory, his next step for his Eagle Scout project is to meet with administration of the nursing home he has identified, with help from a parent in his school district who was inspired by his effort. The money Alejandro raised will help pay for the MUSIC & MEMORY® Certification Program for the site, although he will also ask the facility to contribute some to the training, so they have a vested interest in the project. Any money left over from the donation drive will go toward purchase of additional iPods and music. Although he has until he turns 18 to earn his Eagle Scout rank, Alejandro doesn’t intend to wait that long to complete his Music & Memory project and hopes to finish by the end of the school year. But his work won’t stop with the project’s end. “I want to stay involved, to see how my project will benefit others,” he says. A true leader in the making.